There's a right way to navigate the school car line, and a wrong way. Actually, so many wrong ways. If you have kids in school, you’ve witnessed it. The fighting, the brawling, the all-out chaos that makes “Lord of the Flies” look orderly. And, no, it’s not the kids in the schoolyard. 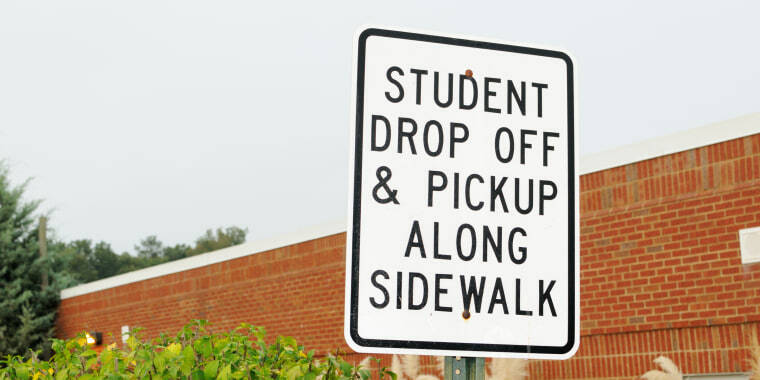 It’s the parents in the car drop-off or pick-up line. Or, as I call it, “the Thunderdome,” a Mad Max-style dystopia where cars are king and respect for mankind goes out the passenger seat window. In a study by British insurance company Allianz, more than 1,000 parents were surveyed for their levels of cortisol, the stress hormone, as they did their school day morning routine. Levels peaked just before leaving the house to drive to school, at around 8:15 a.m. each morning, researchers found. And the impact of the school run stress stays with parents well into the day. Also, nearly 25 percent of parents surveyed said that morning drop off stress sets their mood for the day — good or bad. We’re all adults. We know better. And it’s so simple. We are taught in preschool how to form a line. It’s not complicated. In fact, the simplicity and efficiency of “the line” is what separates us from the apes. Or at least it should. Unfortunately there are just always people who believe they’re above the system. They’re “in a hurry,” “running late,” or just “dropping their kid off super fast.” Well here’s a newsflash people — we’re ALL just dropping our kids, in a hurry, and running late for a meeting — that’s why we’re in the car line, too. Rule #1: Do NOT get out of your car. Ever. Not to “quickly grab” your kid, wave “come on” to your child over the playground fence, or just say “hi” to your friend in line behind you to tell her how much fun you had at Girl’s Night Out. Stay in your car. And when the car in front of you moves, you move. Rule #2: Put down the cellphone. Don’t text or type emails. Waiting for your kid in your empty (and wonderfully quiet) car seems like the perfect opportunity to catch up on work – but it’s also a distraction. People on their phones don’t notice the car in front of them has moved, and as we learned in Rule #1, you know what to do next. More importantly, it’s dangerous. People on their phones don’t see children darting out between cars to the parents breaking rule #3. Rule #3: Don’t double park. Maybe you’re thinking “I’ll just pull up alongside this nice lady here and my kid can run out in front of her and jump in.” No. “But I see my kid right there!” Good. Then you can wave at them to meet you at the end of the line when you circle back around the block. Plus, it’s illegal. Rule #4: DON’T cut the line. It doesn’t matter that there is a gap the size of the one in Lauren Hutton’s smile in front of that BMW ten cars up. We’re all waiting for them to get off their phone and move up (pop quiz: “What do you do when the car in front of you moves?”). Zipping into that gap is like cutting the line at a cupcake shop. You wouldn’t pull that $#*% at Sprinkles, would you? Rule #5: Leave the PDA at home. You love your little one and want to send him on his way to school with a kiss. That’s lovely. You’re cute. But if little Johnny won’t get out of the car or he’s not ready to say “goodbye,” go park your car and walk him in. Even better? Install an ejector seat. People are waiting, folks. Rule #6: The rules of the car drop-off lane apply to everybody, no matter what kind of car you drive. So move your Maserati to the back of the line, dude. You’re giving the 1 percent a bad name. Rule #7: Move swiftly. Once your kids locate you, get them into the car and get going. Don’t sit there in line and have the “how was your day?” discussion with them. In short, a little politeness goes a long way in the car lane (and beyond). Remember, being behind the wheel of a car doesn’t make you invisible. We see you. We all see you. Including our children. So let’s try to set a good example. Now put the phone down… the car in front of you just moved up. Sarah Maizes is author of "On My Way to School," and a mother of three. For more of Sarah’s parenting wisdom and unsolicited advice, go to www.SarahMaizes.com, or find her on Facebook or Twitter. This article was originally published on Oct. 14, 2016.